Sun sparkling on deep pools, dappled green leaves overhead – who could resist a refreshing dip in Devon’s beautiful waters? Summer has brought fabulously scorching days to Devon and an old-fashioned dip in the river is one of our favourite ways to cool off. A sunny riverbank picnic lunch and a splash with the family, or a peaceful solitary dip at dusk as bats start to flit overhead… you can’t beat it! And it’s not just for summer – for the resilient, a New Year’s Day dip is the perfect way to start the year. A couple of generations back, our grandparents learned to swim in natural pools and it’s where people congregated on a warm summer day, to paddle, play and plunge in. Who can forgetA Room With a View’sMr Beebe, Freddy and George bathing in a woodland pool or Mr Darcy emerging from the lake? Now we’ve rediscovered the traditional simple pleasure. The Devon valleys down which water cascades from Dartmoor springs to the sea are picture-perfect, with trout shining in secret bottomless pools, dippers on rocks, and wagtails and impossibly blue dragonflies skimming over the water. Irresistible. Possibly the most popular swimming place on the moors, which can get crowded, but children love the sociable buzz of mass picnicking and newly made friends. It’s easy to get to and has a good grassy area on the banks of the River Dart, plus a deep channel for jumping into. Sharrah Pool, a two mile walk, is the best stretch of river for swimming. The perfect wild swimming compromise if you’ve small children. This picturesque 1930s outdoor pool in its sheltered dip beside the River Teign is fresh and invigorating and has a toddler pool, hot showers and tea hut for creature comforts. It’s the largest open-air freshwater swimming pool in the South West, cherished by locals and a revelation for visitors to the friendly little town. Near the southern Dartmoor village of Holne, this remote pool is one of a series hidden at the base of a deep gorge where the River Dart cascades through wild woodland. With mini waterfalls and rapids, there’s plenty of fun to be had. You may find beach shoes or similar useful when clambering over rocks. We’re loathe to pinpoint our favourite pool in the Teign, because the beauty of swimming this river is the absolute silence as you drift through golden peaty water under sun-dappled beech, interrupted only by the heavy plop of a leaping salmon. But follow the riverside footpath between Chagford and Steps Bridge and you can take your pick of weir pools, where trout fry will tickle your toes. 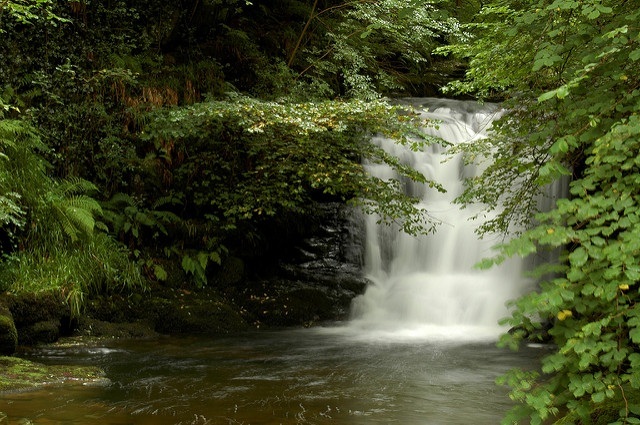 This wooded Exmoor valley near Lynmouth has some handy plunge pools next to the National Trust tea rooms, but if you follow the river downstream you come to Long Pool, a picturesque spot with a waterfall surrounded by oaks and ferns. It’s a great place for spotting wildlife whilst you swim. Near Ottery St Mary you can easily access the river from a sunny field which is excellent for sunbathing and picnics. There’s a calm area of water for swimming near Fluxton weir, surrounded by willow and complete with a natural jacuzzi and rope swing. If you’re a strong swimmer, there’s a 2½ mile stretch of the estuary between Aveton Gifford and Bantham beach which will transport you to a secret world inhabited by a wealth of wildlife, particularly fish and birds, protected by wooded banks. You’ll need to avoid tree roots and seaweed, but the sandy bottom is clear and you can even see the oyster beds. Start soon after high tide. A 47ft deep pool on the River Tavy near Bere Alston, with further pools, rapids and a pebble beach downstream from the old packhorse bridge. The valley faces south-west so warms up beautifully during summer months. You can jump into the deep pool, but take care because it is narrow. Not a river, but a quiet, remote beach at the mouth of the River Dart, just around the corner from Dartmouth Castle, where you (and your dog) can swim. If you come within an hour either side of high tide, it’s possible to swim with care through a rocky channel to the left of Sugary Cove and emerge in Castle Cove. Not a typical West Country name, but it’s how Charles Kingsley, author of The Water Babies, described these sandstone sea caves between Paignton and Torquay. Famous with the Victorians, they’ve now been almost forgotten, but strong swimmers venturing inside enjoy a spectacular experience. …. and finally, we’ve struggled to agree on a top ten of our favourite wild swimming places – there are many, many more we love in rivers, old quarries and coves, so do go exploring. But please stay safe – fast-flowing water, slippery rocks, cold temperatures and submerged objects are all potentially hazardous.